Very important: Volunteers who handle bats must be vaccinated against rabies, and provide proof of vaccination status before they arrive. What we look for in a volunteer: We need self-motivated people who can learn quickly, genuinely care for the bats and work well in a team. This requires a certain type of person as well as a certain level of maturity. For this reason, persons under the age of 21 are less likely to be accepted as volunteers. We encourage all volunteers to exercise daily, whether it’s a run or just a short walk. This is especially so in the months where a lot of time is spent sitting and feeding the baby bats. We appreciate volunteers with practical skills or those with a medical, veterinary, IT or environmental education background. However above all we look for those with a positive attitude to life and this volunteering opportunity. When to come: Volunteers are needed all year but especially during tick paralysis season when hundreds of adults and orphans come into care. These are the months from October to February. We usually need 4 to 8 full-time people, as well as our dedicated group of local part-time volunteers. We prefer a minimum stay of one month in busy season, and two weeks the rest of the year. Experienced flying fox carers can be an exception to this rule. Apply as early as you can to maximise the chances of coming at your preferred time. Type of work: Work at the hospital in tick season is varied. Typically volunteers will help prepare large amounts of food for the adults and orphans; feed/clean/weigh/measure the orphans, clean cages, wash large amounts of bat and human laundry, participate in trips to the rainforest to search or release (depending on season); and help with miscellaneous projects around the hospital. We buy fruit in bulk (apples1000kg and bananas 350kgs) and these need to be unloaded into boxes for storage in fridge or food safe. We make large amounts of banana smoothie on particular days, and this is then stored in the freezer and brought out as required. Caring for sick or young animals is like caring for sick or young humans, many tasks are very repetitive but your love and respect for the animals will make it very rewarding. Some volunteers also help with visitor tours. Outside of tick season the work is less varied and demanding as a lot fewer bats are in care. Rabies Vaccination: Volunteers who work with bats must be vaccinated against rabies. This requires 3 intramuscular injections of 1ml over 3-4 weeks. The course must be completed before getting to the bat hospital. The rabies vaccination is for Australian Bat Lyssavirus (ABLV), the most closely related virus to rabies. ABLV is extremely rare in Spectacled flying foxes but it is a condition of our permit that all bat handlers are vaccinated. You must be able to provide us with a copy of the vaccination certificate or recent blood titre test results before you arrive. We do take unvaccinated volunteers but they do not handle the bats. Working Hours: During tick paralysis season, volunteers typically work 7 days per week for an average of about 10 -15 hours a day. We try to have some volunteers working late, and others starting early. Early shift starts by 6am, and late shift ends about 11pm. We all work 10 -12 hours a day though at this busy time of the year, with breaks as often as possible. November is always the busiest month as we can have up to 200 babies being hand-fed 4 times a day. Volunteers unable to commit to this pace are encouraged to live offsite and roster on as it suits. Every effort is made to give long-stay volunteers a break for a few days during the season. Please be aware of your own limits and let someone know if you need help or time off. Outside of tick season we are far more flexible, and days off for excursions or a break can be easily accommodated. Please remember: You are here to help, not holiday, though we do our best to include excursions. In return you have the unique privilege of working with bats in a wonderful environment. Workplace Health and Safety: See our requirements on the Application page. Accommodation: Volunteers are accommodated in several ways. The two-room self-contained apartment is the central base for all the volunteers. It contains a separate bedroom with 2-3 single beds; a living area with TV etc; compact kitchen, bathroom, and verandah area. The apartment provides well above the usual standard of volunteer accommodation. A single room in the Nursery building with bathroom next door. Large confortable gazebo tents that offer more private accommodation. There is power to the tents but all bathroom facilities are a short walk up to the Nursery building. This is usually the best option for couples as one for the tents has 2 rooms. Volunteers with cars are welcome to find accommodation in Atherton. We always have to factor in accommodation when we take volunteer bookings. Please let us know as soon as possible if you want to change your dates of volunteering. For those with cars, it can help if you stay offsite especially in busy season. We’re happy to help you with this. Meals: We eat very well at the Bat Hospital and cater for vegetarians and vegans. Each night we share a delicious healthy meal, but everyone caters for themselves during the day. All volunteers are expected to help with preparing evening meals or cleaning up afterward. We discuss with each volunteer when they arrive what they would like for breakfast and lunch, and provide ingredients. but everyone prepares (and cleans up) their own food during the day. Alcohol is tolerated at the hospital but consumption must be moderate. Smoking must be well away from living areas and bat facilities. Communications: We have good wireless internet. Volunteers are encourageed to bring their own computers/tablets /smartphones etc. There is no mobile phone reception here but to pick up messages volunteers can put their phones into the car that goes to town every day, or get a lift into town. Every night we sit down to a lovely meal with lots of lovely volunteers. We eat outside for much of the year unless there are too many insects or it’s too cold. We try to make sure there is time to see some sights and get some exercise. The bat hospital is 7kms from Atherton. 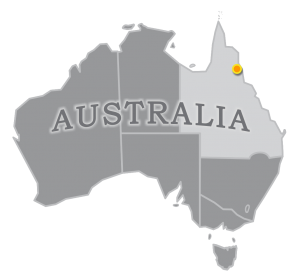 Although a relatively small town, it has all the necessary infrastructure for banking, health care etc It is about an 80 minute drive from Cairns, the nearest international and domestic airport. Once you get to Cairns in far north Queensland, there are 2 ways to get here. The easiest is with Tablelands Tours and Transfers, a private bus that will bring you door to door. This is especially useful and good value when you are arriving. For $120 (more if between 6pm and 6am), you will be picked up at the airport and brought straight to the bat hospital. The waiting times depends on your arrival time and other bookings. Please contact Darrin through his website, any problems let me know and I’ll contact him. We highly recommend this service, especially for those arriving on long flights from overseas. The other way to get here is to catch Transnorth Buses ($25) from Cairns Central to Atherton. You need to allow 1.5 hours to get from the airport to Cairns Central by airport shuttle bus ($15). It is only a 5 km trip but the bus might take 15 minutes to leave, and it drops people off at their accommodation on the way. Ask the Airport Shuttle to drop you under the Cairns Central Shopping Centre, platform 1 where the Transnorth bus leaves from. We will meet you off the bus in Atherton. Transnorth Buses can deliver you back to Cairns for $25 or to the airport for $30. They are allowed to drop people off at the airport but not pick up. They are a cheaper but still convenient way to leave. Analyse all this bus information if you have some control over your flight times and you will avoid long wait times for transfers to and from Atherton. Costs: For the first full month all volunteers contribute AUD$50 per day to assist with accommodation, meals, laundry and internet access. It does not cover alcohol or snacks or special diet food. If staying for less than one month, this fee is higher but varies with length of stay. After one month, the daily rate reduces further. After 2 months the rate is negotaible. Volunteers wanting to undertake research projects need to negotiate a rate as there will be demands on the coordinator’s time. We offer a truly unique experience for bat enthusiasts in beautiful surroundings and excellent facilities. Volunteers need to pay a non-refundable deposit of $350 when their application is accepted. We use the first week as a trial period and reserve the right to terminate your volunteering if necessary. This is a clause in our contract with you to allow for the very occasional volunteer (only 2 in the 10 year history of the project) with whom there are too many difficulties. Please go to the Donate button on our home page to make the payment, using Paypal or credit card. Our bank deatils are there too if you’d prefer to do a bank transfer, a good option if you have an Aussie bank account. Everyone pays a minimum of $50 a day for the first 4 weeks, then the daily rate reduces further. You will be in the tropics in an area with much wildlife. Please respect them all, including spiders and snakes. We cannot expect people to respect and value bats if we cannot do it ourselves for other species. Just let us know if you encounter wildlife that you find difficult to deal with. Keep the screen doors of the volunteer room closed. 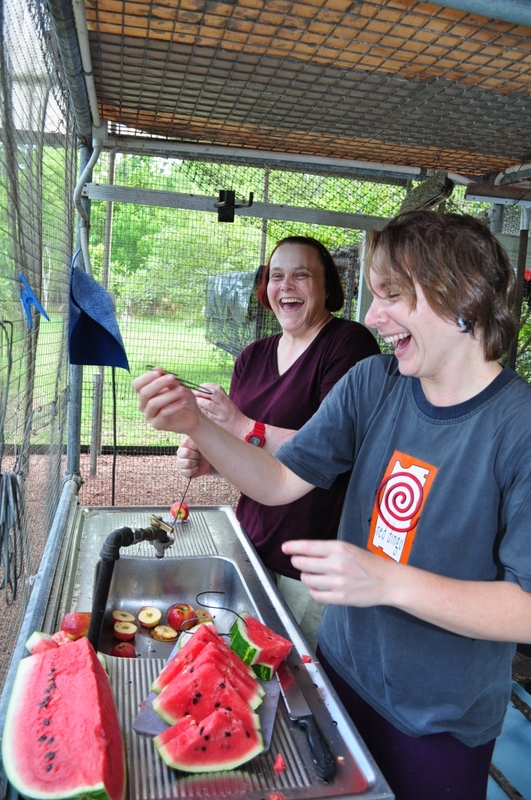 The bat hospital is home for Jenny and Ashleigh. Please take notice of and respect their ways of doing things. Living with a constant changeover of volunteers for 9 months of the year can be stressful. The Volunteer Manual is a good guide to how best to do this. We weigh and measure orphans for growth weekly. … and always lots of laundry. We avoid using dryers.